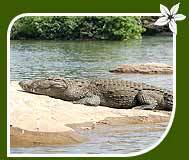 Crocodile or Magar Macchh is one of the specific reptiles found in Indian subcontinent. According to Hindu mythology, it is the vehicle of Varuna, the rain God. Lazy, silent but highly dangerous, this reptile reaches 4 m to 5.5 m in length and weigh around 200 kg. 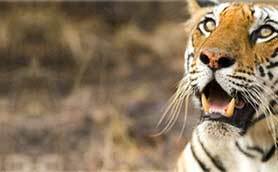 Its snout is the most distinctive feature, it is 1 1/3 to 1 1/2 as long as broad at the base and has 19 upper teeth on each side of a heavy set of jaws. The the upper part of mugger is usually lighten or brown with cross bands on the body and tail. The below part is white or yellowish white. 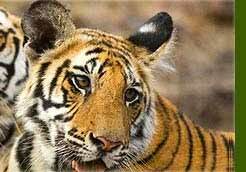 It has a well developed and flattened tail. Crocodiles are usually found in rivers, lakes and other large water bodies up to 1,200 m elevation throughout India. Crocodiles prefer the slow flow of water and spend their days at the bank of rivers, lakes or at the foot of tree and below the rock basking and slip in the water while feel any danger. With high sense of hearing, watching and smelling, crocodile is known for fast swimming and grabbing the hunt opening the long jaw. Crocodiles usually eats fish and small and large mammals and establish the mating in the mid January in the water. Crocodiles has been ranked among the endangered reptiles. 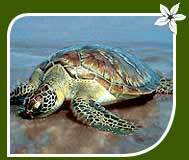 Green turtles are one of the five species of sea turtles inhabiting in the coastal waters and bay Islands. They are usually of one meter and weigh 155 gs. They have four coastal shields and 25 marginal shields which protect it from any external harm. And its limbs are normally with a single claw and jaws are not hooked. The most interesting fact about the turtle is their breeding take place in body pit dug in soft sand under the sea just 50 cm below the beach level. A female turtle gives around 100 eggs in the pit and covered it from above. When the temperature reaches to 35 oC, young turtles emerge out after 40 days. They can be observed in shallow seas of Gujarat coast, Gulf of Munnar, Andaman & Nicobar.